Many seniors may feel at their age they do not need to exercise or begin an exercise program in their later years. The truth is senior wellness is a never-ending process that benefits everyone by leading to a healthier, more active lifestyle. As we age, everyday tasks become more difficult, such as getting in and out of a chair, walking for longer periods of time or lifting and carrying items such as groceries. 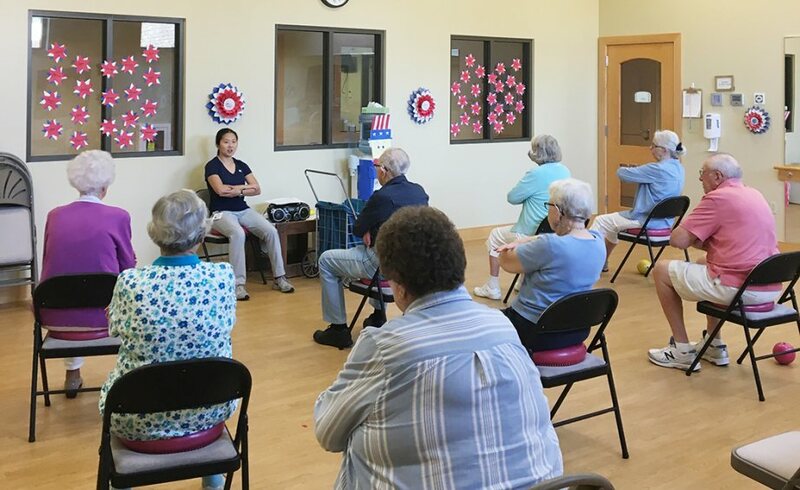 The main goal of the program is to promote senior health and wellness by helping residents stay as active as possible, for as long as possible. The wellness department offers multiple levels of exercise classes. Senior fitness classes are structured based on ability and focus on range of motion, strength, balance/coordination, flexibility and aerobic activity. Flexibility & Range of Motion – Aging can affect the structure of your bones and muscles leading to pain and decreased range of motion. Through stretching and range of motion exercises residents are able to relieve pain, maintain or improve range of motion and eventually restore joint mobility. Strength Training – Through the natural process of aging, our bodies begin to lose bone and muscle mass which unfortunately puts individuals at a higher risk for osteoporosis and bone breaks. By starting a strength training program, you can reduce signs and symptoms of numerous diseases and chronic conditions such as: arthritis, diabetes, osteoporosis, obesity, back pain and depression. Even small changes in overall muscle strength can have a huge impact on daily activities. Aerobic – Increasing aerobic activity provides a number of benefits to older adults. For example, improved endurance and mobility for activities such as walking distances, plus increased blood flow, decreased blood pressure and higher energy levels overall. Balance & Coordination – Regularly engaging in activities and exercises to help maintain balance and equilibrium helps you to recognize disorientation and changes in your balance. Recognizing these changes will help you avoid falls that can lead to serious injury. Emotional – Not all wellness is physical. Our mind and body are connected in a way that they will start affecting each other if one is off. 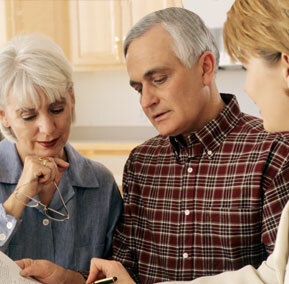 For example, seniors may become depressed and have mood behaviors if their physical health declines. It can be very frustrating for anyone to not be able to do a task that was once easy. Daily trivia and puzzles offered to promote mental stimulation and social interactions. Over 20 exercise classes per week dedicated specifically to resident wellness. 3 different levels of land classes and 2 levels of pool classes allow residents of different exercise backgrounds and abilities the opportunity to participate. Individual assessments done twice a year to track progress and identify areas that may need more focus. 24/7 access to cardio and strength room with senior-friendly equipment to be used when you want. In 2016 we had an average of 128 people per week participate in senior health and wellness activities. 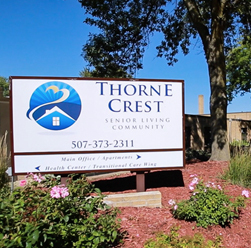 At Thorne Crest, the wellness department’s main goal is to improve the quality of life and preserve the independence of every resident. All senior wellness and fitness classes and programs are designed and taught with a ‘resident comes first’ mentality with safety and practicality in the fore front of our minds. Please give us a call at 507-373-2311 to learn more or to schedule a tour.